My Money Sense by Andy Ong: My latest Acquisition and my Proudest too…. I have been keeping quiet until I exercised my option to my latest acquisition. This is my dream property and I started work on this 15 months ago. The House of Tan Yeok Nee is a national monument and it is the only Teochew style courtyard mansion in South East Asia. Mr Tan Yeok Nee is a business legend who came to Nanyang to escape poverty in Chaozhou, China. He amassed a great fortune from business in Singapore and Johore. He is what we call the ultimate entrepreneur of his time. The House was painstakingly built by him and is the only surviving member of the “Four Great Mansions” from that period. 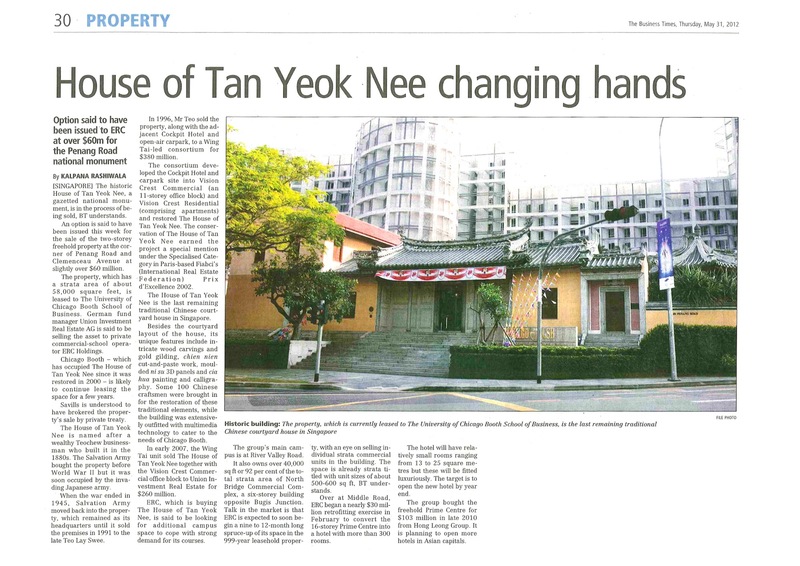 “The House of Tan Yeok Nee occupies approximately 2,000 square metres of elevated land along Clemenceau Avenue. The mansion has been carefully restored with great sensitivity to ensure that the original architecture and character of the house is kept intact. The walls, tiles, roof, pillars, carvings and pottery were restored to their original state of a century ago through painstaking research. However, contemporary facilities and equipment have also been incorporated to adapt the building for modern day usage. With the wide array of beautifully restored traditional Chinese decorative elements and the convenience of present day state-of-the-art technology around the house, this combination of 'old' and 'new' provides a unique environment rich in history and culture. The front and back portions of the house face east and west. Pillars on the front door are made of marble with colourful carvings of stories reflecting the lives of Tan Yeok Nee’s ancestors in Chaozhou. The back of the house has a distinctive style exhibited by beams with special Teochew tiles, a main pillar decorated with gold-plated carvings, and a marble floor. Exquisite, colourful tiles reflect Chinese people characters and animals. I am half-Teochew, from my mother’s side. I identified and fell in love the moment I stepped into the mansion. Given that it was gazetted as a national monument and there are very few of such buildings in private hands, I consider myself to be so blessed to be given such an opportunity. The Business Times reported the acquisitions before I can notify you, the reporter was very good! I have been looking for a suitable building to house our entrepreneurship education and I believe there is no better place in Singapore. And the best part is, it is a price that I can afford. I consider this to be a once in a lifetime opportunity, and if money was the issue, then it will be a regret of a lifetime. I attach some photos for your viewing pleasure.